At Platinum Physiotherapy, we understand that hip and groin pain can have a significant impact on everyday activities including walking, running, climbing the stairs and sleeping. Our physiotherapists provide treatment for a wide variety of hip and groin conditions so that people can get back to their daily and sporting activities as soon as possible. Physiotherapy treatment will firstly assess your physical function and current symptoms so that a structured rehabilitation programme can be developed between you and your physiotherapist. This will include short and long term goals tailored to you so that you make the best possible recovery and get back to the activities you enjoy. Osteoarthritis of the hip is a condition characterised by degeneration or ‘wear and tear’ of the cartilage that surrounds the hip joint surface, leading to inflammation, pain and stiffness. This may occur following a specific injury or due to repetitive forces going through the hip beyond what it can withstand over a period of time. As the condition progresses there is eventual wearing down of the bone ends so that the surfaces are no longer smooth and may have small bony processes called osteophytes. The most common symptoms of hip osteoarthritis are pain in the front of the hip, buttock or groin and stiffness. People with osteoarthritis typically develop symptoms gradually over time. 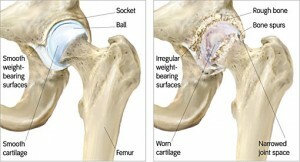 In minor cases of hip osteoarthritis, little or no symptoms may be present. Symptoms can often differ from month to month with people reporting an increase in symptoms with colder weather. Other symptoms may include muscle weakness and difficulty walking. Treatment at Platinum Physiotherapy will reduce pain and stiffness, improve hip range of movement and strength, and help you remain as active as possible. A thorough assessment will identify your main problems and a rehabilitation program will be developed between you and your physiotherapist to restore strength and mobility. Range of movement and hip strengthening exercises to prevent stiffness and weakness from developing and to ensure the hip is functioning correctly. Physiotherapy treatment for people with osteoarthritis of the hip, will ensure you reach your maximum physical potential and continue with your hobbies and everyday activities to the best of your ability. Trochanteric bursitis is inflammation of the trochanteric bursa, a small fluid filled sac located at the outer aspect of the hip, causing pain and reduced function. Trochanteric bursitis is commonly caused by repetitive stress placed on the trochanteric bursa during activity such as running, jumping, walking. Occasionally, trochanteric bursitis is caused by a direct blow to the point of the hip such as a fall onto a hard surface. What are the symptoms/effects of trochanteric bursitis? The main symptom of trochanteric bursitis is pain in the outer aspect of the hip, which may radiate down the outer aspect of the thigh as far as the knee. Pain may also be aggravated by side lying, running, jumping, climbing stairs, sitting cross legged, getting in and out of the car or walking. At Platinum Physiotherapy, physiotherapy treatment will speed up your recovery and reduce the likelihood of it re-occurring. Early physiotherapy treatment is vital to hasten your recovery and ensure success in the long-term. A graduated flexibility and strengthening program of the surrounding muscles once pain has settled will ensure you get back to the activities you enjoy the most as soon as possible. Your physiotherapist will advise you on which exercises are the most appropriate for you when they should be commenced. Physiotherapy treatment will reduce pain and inflammation, restore range of movement and muscle strength so that you can get back to your everyday activities as soon as possible. Iliopsoas Bursitis is inflammation of the bursa (fluid filled sac) which lies underneath the tendon of your iliopsoas muscle, in the front of your hip. Iliopsoas Bursitis is commonly caused by repetitive activity such as running, walking, climbing and squatting that requires constant movement of the hip, overworking the joint and leading to irritation and inflammation of the bursa. What are the symptoms/effects of Iliopsoas Bursitis? Pain on movement such as walking, running and climbing the stairs. Tenderness in the groin area. Sometimes a mass may be felt resembling a hernia. The person may also feel numbness or tingling if adjacent nerves are compressed by the inflamed bursa. Treatment at Platinum Physiotherapy will significantly decrease your recovery time and decrease the likelihood of future recurrence. An initial assessment will determine which factors have contributed to the development of the condition, and an individualised treatment program will be developed to correct these problems and ensure the best possible recovery. Sport specific exercises. This may include a graduated return to running program in the final stages of rehabilitation to recondition the hip flexor muscles for running in a safe and effective manner. Your physiotherapist will guide you through your treatment program and will ensure that you reach your maximum potential before returning to sport or everyday tasks. Snapping hip syndrome, sometimes called dancer’s hip, is a condition in which the person feels a snapping of the hip when it is flexed or extended. The snapping is caused by the movement of a muscle or tendon over a bony structure. Snapping hip is categorised by the location of the injury. It may be to the side (lateral) in which case the snapping or clicking sound is on the outside of the hip; or at the front (internal) with the snapping sound at the front. The most common site is the outside. As you bend the hip the tendon moves across the thighbone, as you straighten the hip, the tendon moves back to the side of the thighbone. This back-and-forth movement, or dance, if you will, is what causes the snapping. 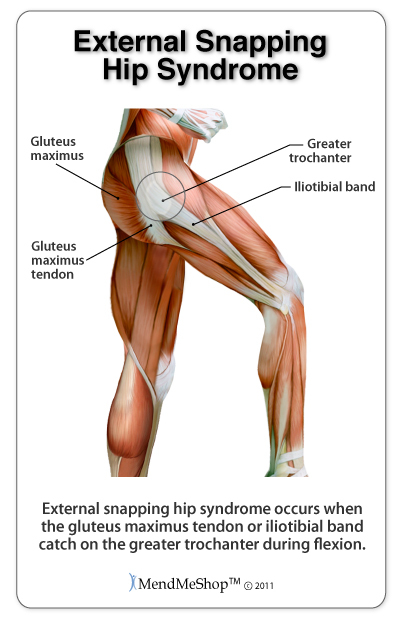 What are the symptoms/effects of Snapping Hip syndrome? This condition is common in dancers, football players, track and field athletes and gymnasts, who use repetitive hip flexion movements. There may be an audible snapping or popping sound followed by pain which decreases when the activity stops. Symptoms can last for months or years without treatment. Snapping hip injury is sometimes painless and can be left alone. Where there is pain, the athlete should apply the RICE formula (rest, apply ice and compression and elevate the affected area). Rest from running or jumping is important, especially running uphill. Leg lifts and flutter kicks should be avoided. Your doctor may prescribe anti-inflammatory drugs to relieve pain. Surgery may be required in extreme cases. Where physiotherapy is required it will focus on pain management and manual therapy. Active and passive stretching of the hip and knee will form the core of treatment. We will educate you on proper technique and activity modification. Once symptoms have decreased, a maintenance program of stretching and strengthening exercises may begin. Light aerobic activity for warm-up followed by stretching and strengthening of the hamstrings, hip flexors and the iliotibial band will help to prevent recurrence. A fractured neck of femur is when the thigh bone (femur) fractures near to where it attaches to the hip joint and is the most serious consequence of falls among older people, due to loss of mobility and independence. 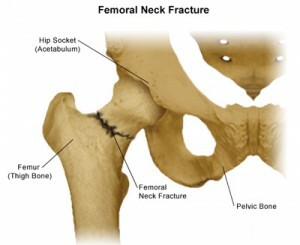 What causes a fractured neck of femur? The most common cause of a fractured neck of femur is falls and usually affects older people. Older people are more likely to suffer from this type of injury due to osteoporosis and osteomalacia (softening of the bones). In younger people the main cause of a fractured neck of femur is a high energy injury such as a car accident. What are the symptoms/effects of a fractured neck of femur? If you suspect you have broken your leg you must seek medical attention as soon as possible. A doctor will conduct a thorough physical examination of your hip and leg as well as take an X-ray to confirm a diagnosis. The type of treatment provided will depend on the extent of your injury. Treatment for nondisplaced fractures, that is if the femur has not moved out of place, is usually bed rest and/or use of crutches until passive hip movement is pain free and x-ray films show evidence of bone formation. If the fracture is displaced (out of place) surgery will be required which involves fixing the bone back in place using pins or screws. Other forms of surgery include a hemiarthroplasty or half a hip replacement when the head of the thigh bone is removed, and a metal prosthesis is implanted into the joint. Following your operation you will be seen by a physiotherapist who will help you move your hip and leg and get you out of bed. You may also be provided with a walking aid to ensure you are safe on your feet while you are recovering. Before you are discharged from hospital you will be assessed on the stairs and provided with some exercises to continue with at home. At Platinum Physiotherapy we provide treatment for people following a fractured neck of femur. It is important to continue physiotherapy following your operation for the best possible recovery. Physiotherapy treatment will improve your mobility and increase your independence with everyday activities. Muscle strengthening and stretching program for your leg and hip muscles. Your physiotherapist will develop a full treatment plan to suit your individual needs. Physiotherapy treatment will reduce your pain and stiffness and improve muscle strength and flexibility so you can mobilise safely and effectively and return to your everyday activities with confidence and success. A hip stress fracture is a hairline crack usually in the femoral neck, the short section of bone that connects the head of the femur to the main shaft of the bone. The femoral neck is a thinner part of the femur and is therefore more susceptible to stress fractures from overuse activity. The main cause of a stress fracture is repetitive stress placed on the bone which overwhelms the bones ability to adapt. This usually happens when someone suddenly begins a new, strenuous, repetitive activity such as running. Stress fractures can occur in other areas of the hip and pelvis, but the femoral neck is the most common. What are the symptoms/effects of a stress fracture? A doctor or physiotherapist will take a detailed medical history including questions about your activities and exercise and then physically examine the painful hip to confirm a diagnosis. Your doctor or physiotherapist will probably suggest taking an X-ray, bone scan or magnetic resonance imaging (MRI) of your hip to give a more accurate diagnosis. Conventional treatment will involve resting from activity that makes the pain worse and modifying activity levels to allow the fracture to heal. If the pain occurs while walking, then crutches should be used. Surgery may also be required if your doctor is concerned that the fracture may displace (move out of place) to stabilise the bone. Physiotherapy treatment will help speed up the healing process by advising you on how to structure exercise, mobilise safely and effectively and strengthen your muscles without aggravating pain. Treatment at Platinum Physiotherapy will ensure that you make a full recovery and prevent the injury from re-occurring. An initial assessment and a detailed account of your activity levels will identify your main problems in order to develop an effective treatment plan. Progressive exercise program which will help stretch out tight muscles and strengthen muscles around your affected hip and leg in a safe way. Physiotherapy treatment for people with a stress fracture will ensure you make the best possible recovery and return to your hobbies and everyday activities as soon as possible. What is an adductor strain? An adductor strain is tearing of some or all of the adductor muscle group in the groin. An adductor strain can range from a small partial tear to a complete rupture and can have a significant impact of sporting activities and everyday function. What causes an adductor strain? An adductor strain is commonly caused by sudden contraction of the adductor muscles which can occur during rapid acceleration whilst running, changing direction or kicking. An adductor strain commonly affects footballers, athletes and gymnasts. What are the symptoms/effects of an adductor strain? 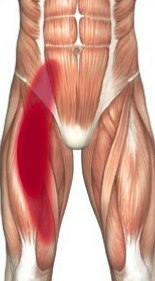 The main symptom of an adductor strain is sharp pain or pulling sensation in the inner thigh or groin. People with an adductor strain may also have difficulty walking, swelling, muscle spasm, weakness, stiffness and bruising on inner aspect of the thigh and groin. People with a groin strain will benefit from physiotherapy. Treatment will identify the extent of your injury and develop a treatment plan to reduce pain and swelling, regain range of movement and muscle strength and gradually get you back to your hobbies and daily tasks. Physiotherapy should be commenced as soon as possible following your injury to ensure a speedy recovery. A progressive flexibility and strengthening program to once pain has settled to recondition the groin muscle and reduce the likelihood of re- injury. What is a stress fracture of the pubic ramus? A stress fracture is a crack in the pubic ramus which makes up the pelvic bone and is often termed a ‘hairline fracture’. What causes a stress fracture of the pubic ramus? Stress fractures of the pubic ramus are commonly caused by repeated stress placed on the bone over a period of time that overwhelms the bones ability to remodel. Stress fractures are common sports injury and seen in athletes who run and jump on hard surfaces, such as distance runners, basketball players, and ballet dancers. What are the effects/symptoms of a stress fracture of the pubic ramus? A doctor or physiotherapist will take a detailed medical history and then physically examine your pelvis and groin to confirm a diagnosis. Your doctor or physiotherapist will probably suggest taking an X-ray, bone scan or magnetic resonance imaging (MRI) to give a more accurate diagnosis. Treatment at Platinum Physiotherapy will hasten your recovery by reducing pain, advising you on how to structure exercise, and strengthening your muscles safely and effectively. Your physiotherapist will assess your condition, diagnose your main problems and help you understand it. Individualised exercise program which will help to strengthen muscles around groin, hip and leg. Physiotherapy will ensure that you make a full recovery and continue to make significant improvements in the long-term. An inguinal hernia is when part of the bowel pushes through a weakness in the groin called the inguinal canal. 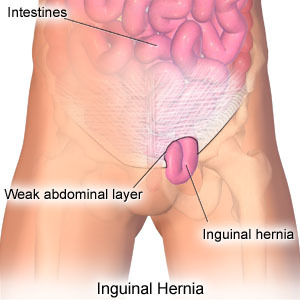 Indirect inguinal hernia – is the most common type of inguinal hernia and is present at birth. This is more common in males and occurs when the entrance of the inguinal canal at the inguinal ring does not close as it should just after birth, leaving a weakness in the abdominal wall. Fat or part of the small intestine slides through the weakness into the inguinal canal, causing a hernia. Premature infants are especially at risk for indirect inguinal hernias because there is less time for the inguinal canal to close. What are the symptoms/effects of an inguinal hernia? A small bulge in one or both sides of the groin that may increase in size and disappear when lying down. This may also present as a swollen or enlarged scrotum in men. To diagnose an inguinal hernia, a physiotherapist or a doctor will take a thorough medical history and physical examination. Inguinal hernias are usually treated with surgery to push the bulge back into place and repair the hernia. This may involve an open procedure or laparoscopy (key hole surgery) depending on your current symptoms. Our physiotherapists provide specialised physiotherapy treatment following your operation. Treatment at Platinum Physiotherapy will shorten your recovery time and advise you on the type of exercises that should be started and when, to ensure you get back to your everyday activities safely and effectively. Stretching and abdominal strengthening exercises at the right time, to regain range of movement and strength. Physiotherapy will relieve pain and discomfort and regain muscle strength and length following your operation, so that you can safely return to work and sport as soon as possible. I made an appointment to see Leighton as i was suffering from acute arm and shoulder pain, and had very limited movement in both. After 3 appointments, movement was significantly improving. Now virtually back to normal – about 5 sessions. Each session was “painful” but really helped. The exercises are very simple and essential to continue at home. I would certainly recommend Leighton to solve any similar problems. As a very injury prone family we have seen our fair share of Mickey Mouse “physios”,but Leighton is very professional in what he does and gets us back on our feet with a touch of humour, we highly recommend him.